In stock. Order in the next 4 hours, 4 minutes and it will go out today! 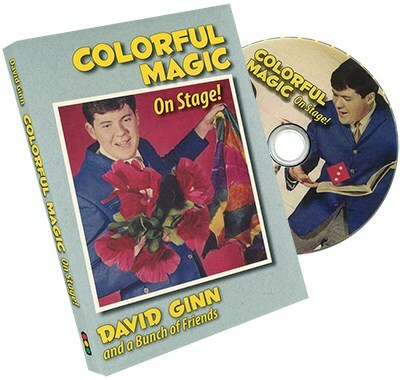 When David Ginn thought about making a final reprint of his first book, Colorful Magic, he realized that much of his material had never been videoed. So he spent an hour going through the book's pages and decided this was his one chance to make that happen. So he started gathering materials, including doves, tricks he hadn't owned in 35 years -- even the Dragon Box (Thayer Tea Chest) Illusion that he sold 15 years ago. The result is a BRAND NEW DVD called Colorful Magic on Stage! David Ginn's first TV appearance in 1965 performing his Dove Act. Bonus: Thayer's Phantom White Cargo 1930s Illusion (performance only). Please note: Most of the material on this DVD has never appeared on any video or DVD. David Ginn explains virtually everything on the DVD, but if you own the Colorful Magic book you will understand things even better. Included on the DVD are seven video clips from David's live shows between filmed between 1965 and 1982. This resource will serve as an excellent springboard for ideas to improve the work that you do for children and their families.